Hi all, like the new format? It looks a bit upside down doesn't it? My previous post explains the reasoning behind it. Before I explain my team's transfers, please be aware of the upcoming FPL schedule. Gameweeks 13-20 span a mere 33 days! In my opinion, this is when the business end of the FPL season starts. Be extra careful with your transfers and avoid having a quasi-empty bench as players will be rested, rotated, and some will be suspended after picking up yellow card no. 5. As for this GW, having said all that, you will have noticed that I have made some rather unusual transfers. Some may call them clever differentials. Others may call them plain stupid. I decided to purchase Pantilimon as he is City's current first choice goal keeper and has a good run of fixtures. His low ownership (0.8%) and cheap price was an incentive too. As for Flanagan, he also has low ownership (0.1%). I decided to buy him after reading that Enrique will be out for a while. Flanagan isn't a guaranteed replacement, but with Liverpool's good run of fixtures and his differential status, I couldn't say no. Both are short-term transfers that will either be fruitful or fail. All my strikers scored last week, alas I captained Ozil (I will probably sell him for Hazard soon). This week, I am going purely on form and captaining my #hotpick Aguero. Last week, Mr. #CalledIt for GW12 a.k.a. Yohan Cabaye delivered already in the opening minutes of the game, for which I thank him very much. Admittedly, I imagined he would upgrade that assist with a goal or two by the end of the game, but hey, not bad! This week I can't look past Theo Walcott. Finally back. Finally healthy. He has been "eased back" in the past two games (League and Europe) and still managed to look dangerous in the limited time given. I hope he gets a start this week, but even if he doesn't, I recommend getting him early. He will start sooner or later and I imagine he will find himself on the receiving end of many brilliant passes from Ozil and Cazorla and favor him to score plenty of goals (or assists to Giroud for that matter). He has shown glimpses of greatness last year and if he wants to take his career to the next level THIS is the season he needs to do so. Want to go to the 2014 FIFA World Cup (NOT as a spectator), Theo? NOW is your chance. Theo Walcott, #CalledIt for GW13. Man with a mission. Other options for this week, if you are looking for differentials, would have to be Alvaro Negredo as City look to continue their scorching home form and, if you are really inclined to taking changes, what about Shinji Kagawa against Tottenham? He seemed to be in top form against Bayer Leverkusen and Moyes hinted he might engage in a little bit of rotation. With a pretty solid run of fixtures after GW14, if he secures that midfield spot, he could be an interesting choice. This week's #JackInTheBox, as always, focuses on a player from a team in the bottom 5 of the Prem who also has less than 3% ownership. It's the "differential's differential", as I've seen it referred to. This week's fixture list for the bottom 5 is juicy, juicy, juicy, as 4 teams in the bottom 5 square off against one another. I can't imagine a better scenario for future #JackInTheBoxes, and having immersed myself in the bottom 5 for the past few gameweeks, am literally buzzing with anticipation to see how things shake out. Sunderland (the only squad to face a non-bottom 5 opponent this week) are away to Villa, and I don't see much in it for a Black Cats squad still struggling to find their footing, especially with the likes of our greatest American hero Guzan protecting a Villa goal that may or may not see much action come gametime. Crystal Palace are away to fellow bottom 5 squad Norwich, while Fulham and West Ham, 18th and 17th respectively, face off in a match at Upton Park that I for one hope I get to see in its entirety this weekend. For this week's #JackInTheBox, I gotta tell ya, I continue to be intrigued by this Norwich squad. After quite an impressive campaign last time around, I remain surprised to see them searching for form, especially considering the investment made during the summer break, and as long as they stay in the bottom 5 they will continue to receive the lion's share of my bewildered attention. Put simply, I don't consider them a bottom 5 side, and still don't expect them to be there for long (come on Van Wolfswinkel, you're a #JackInTheBox in the making once you heal up). In some ways this week's #JackInTheBox was difficult and in some ways it was easy. If you know me by now, you know I'm not a big fan of people who display poor sportsmanship. 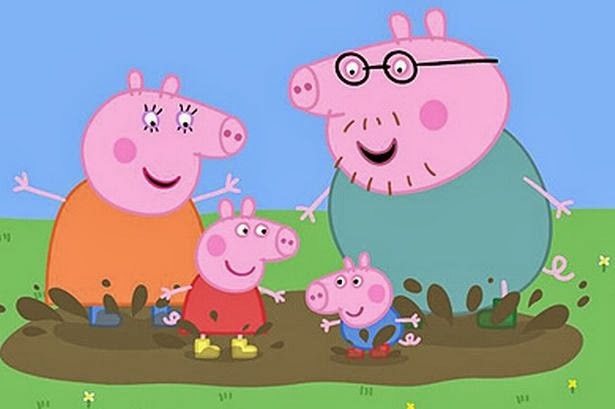 At the same time, while the rest of the footballing world honours a legendary footballer still gracing the pitches of the Premier League on his 40th birthday, I'm also not a big fan of people who shag their brother's wife; especially when that person is a Premier League footballer on one of the most famous teams in the history of football influencing millions of children around the world over the course of 2 decades. No, it has nothing to do with football, but has everything to do with the man himself. In other ways, as I've said, my #JackInTheBox choice this week is quite easy. With an underperforming but quality Norwich side reeling from injuries to two of their midfield mainstays in Snodgrass and Pilkington, it will be up to my GW 13 #JackInTheBox (alongside my GW11 #JackInTheBox) to bear the weight of expectation against a Crystal Palace side showing renewed strength in defence but who I don't believe will be able to keep Norwich at bay for a full 90 minutes, Tony Pulis or no Tony Pulis. Yes, despite leaving a bad taste in my mouth with his unsportsmanlike shenanigans at the end of the Cardiff match a few weeks ago (if you don't remember, look it up, it was quite interesting), I'm going with Mr. Leroy Fer as this week's #JackInTheBox. Fer, after plying his trade for Eredivisie sides Feyenoord and FC Twente, moved to Norwich during this past offseason and has been a mainstay of the Norwich midfield since gameweek 2. Of the 3 times he's made his way onto the scoresheet out of 11 games played, 2 have been within the past 2 weeks and I look to him being at the center of things flowing through the Norwich attack this weekend. He also, including the stats for the injured Snoddy and Pilkington, tops the Norwich side in both FPL points scored and EA Sports PPI for the season to date. At 5.8m you'll pay for the potential he provides, but with upcoming fixtures against W Brom, Sunderland, Fulham and Palace (again) among the next 7, he could be worth getting and keeping around til gameweek 20 and possibly beyond. In a weekend where the bottom 5 will be at the center of attention, I'm really looking forward to seeing how things pan out, and if Mr. Fer comes through as I hope and predict, I may take a shot at this famous Robot Dance that last week's #JITB has become so well-known for. Have a great gameweek everyone...looking forward to your tales of huge FPL points and hope to be able to share one of my own. Despite keeping 7 clean sheets he has been inconsistent of late. Vorm has failed to keep a Premier League clean sheet since October. Facing a City team that has won 6/6 at home (scoring 26 goals in the process). Scored twice and assisted once in last 3 league games. WBA have conceded more than a goal a game on their travels. In form & scored first 3 league goals far quicker than he did last season. City are looking to close the gap near the top. It took him only 11 appearances to score 10 goals. Didn't play a full match midweek so likely to be fresh. VILLA TO BEAT SUNDERLAND (2-1). ARSENAL TO BEAT CARDIFF (1-0). EVERTON TO BEAT STOKE (2-0). NORWICH & PALACE TO DRAW (1-1). WEST HAM & FULHAM TO DRAW (2-2). NEWCASTLE TO BEAT WBA (2-1). TOTTENHAM & MAN UTD TO DRAW (0-0). LIVERPOOL TO BEAT HULL (0-2). CHELSEA TO BEAT SOUTHAMPTON (2-0). MAN CITY TO BEAT SWANSEA (3-0). I am pleased to announce FPLH's partnership with FanXT. They are an award winning sports company specialising in fantasy sports leagues. They are currently the official fantasy football provider of various Asian-based national leagues. 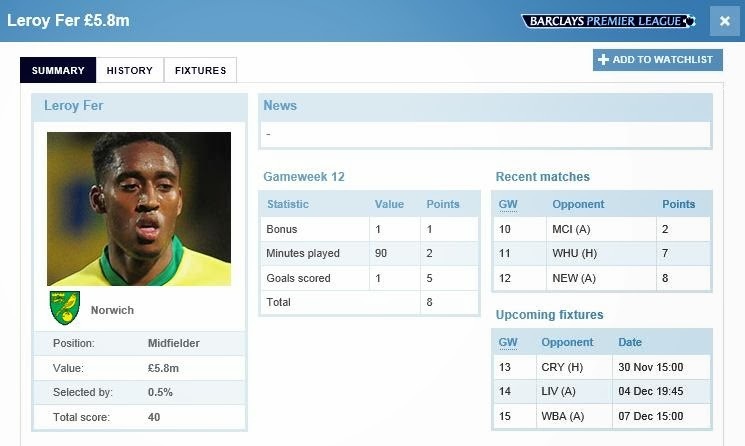 Aside from that (and much more) they also run an unofficial EPL fantasy game. With the latter in mind, I will be providing a hints data feed to them for the foreseeable future. As a result, my weekly previews will also cater for their version too. Just to reassure you, my weekly output and content will remain relatively the same but structured slightly differently. Feel free to follow them on Facebook. How Do You Solve A Problem Like Barkley? This is the conundrum faced by many of us at the moment. 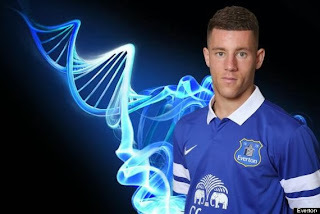 Wonderkid Ross Barkley of Everton was considered to be a "must-have" for the first quarter of the season. An opening day goal, combined with 3 bonus points firmly put this boy on the radar for FPL managers looking for a bargain. And what a price! £4.5 million made his purchase affordable with no need for sacrificial lambs! We could all afford to take a punt at that price. Over the coming weeks his stock rose steadily, despite poor points returns until GW's 5 and 6. The amount of managers transferring him in saw his price rise dramatically, peaking at £5.7 million after GW 8. But after boom inevitably comes bust. A steadily decreasing amount of game time has seen his price (and his points return) fall sharply. As managers bomb him out of their squads, it appears his star - that once shone so brightly - is fading rapidly. Despite the rush to sell him, at the time of writing Barkley is still owned by a staggering 32.3% of you. But why? He's not completing matches, his points return has been poor for a while now, and Everton have some shocking fixtures coming up. GW 13 sees them take on Stoke at Goodison, but the following weeks see them play Man Utd and Arsenal away! Surely his value is only going to plummet further if his game time and form stay the same? He'll get dumped quicker than the jumper your aunt will no doubt buy you for Christmas. I know what you may be thinking, keep the faith with Barkley, he's been given International recognition and he plays that Number 10 role behind the striker that can reap dividends if he gets it right. He may be worth keeping as an option on your bench, but risking him in your starting XI may cause you more harm than good. Do you sell now while you can still get a tidy sum for him? Personally, I transferred him out for GW12 and checking back now I wish I'd done it earlier as I had him permanently benched since GW 6. Still, his price continued to rise so no real harm done. FINALLY! The international break is over and the Premier League is back! I don't know about you, but I have used the time away from the game and relaxed a little bit, as you could see from some of my Photoshop creations I have been sharing on Twitter lately. It was fun. It was relaxing. But now it is time to get back to business. In a week when the captain selection is not that obvious (not at all! ), I have had three strong contenders for the #CalledIt pick. Number 1, and this is a favorite of mine, is Theo Walcott. I have said it once, and I will say it again - he will outscore Özil by the end of the year! So you can imagine that I was really tempted to select him - 3,7% owned, down to 9.1m - a great choice. But I chickened out. He might or might not start the game and Southampton will probably not be pushed around that much. So maybe not this week, but definitely the next one. Number 2, Stephane Sessegnon. A good run of fixtures, solid form, but has already featured here. So it comes down to whom, you ask? Yohan Cabaye. 4,8% owned, 6.3m and playing against Norwich at home. Not much to add here. He has delivered in the last three home games and I predict he will do the same on Saturday. #CalledIt for GW12. WORD OF CAUTION: Cabaye sits on 4 yellows, one away from a 1 game suspension! Well it's 10:30 p.m. here in the U.S. and I can't start writing about this week's #JackInTheBox without first mentioning the excitement that was going on in Manchester earlier this evening. The 2013 Football Blogging Awards, after much anticipation, kicked off at the National Football Museum, and our very own Chief was on hand to experience first hand the glitz, glamour and honour of being one among an extremely talented group of finalists in the Best FPL Blog category. Although the trophy did not make its way back to the Fantasy Premier League Hints headquarters, the pride and honour of being recognized by football fans and supporters as one of the top 5 FPL blogs was felt all the way here in the U.S.A. and Matej and I couldn't be more proud of what the Chief has created, built and sustained here. To be among the recognized powerhouses of the FPL community is nothing short of a true honour, and we congratulate a very deserving winner in @FFPundits and the excellent blog Leon and his team have created. Meeting Leon and the @FantasyYirma team (Ryan and Mark) was also a highlight of the evening, and I know that like me, you all look forward to hearing stories from the Chief about the epic evening. Congratulations Chief on a job extremely well done and a recognition thoroughly deserved! Okay, on to the #JackInTheBox. It seems like forever ago and is almost forgotten already, but last gameweek's JackInTheBox, although playing a pivotal role in the home side's victory, did not get on the scoresheet or rake in any bonus points. I was proud of how Howson played though and despite the disappointment that the bullet he rocketed off the post in the 71st minute didn't dip more quickly, was happy with how he played and felt good about my pick. Although ifs and buts don't count, I came awful close last week to choosing Jonathan Walters as my #JackInTheBox, and given their home fixture against a struggling (but showing signs of resurgency) Sunderland squad, I am going with Stoke. Like the first week of my #JackInTheBox series, I have been very tempted to go with a defender (the likes of Huth and Wilson and Pieters have all caught my eye). Interestingly enough, only Begovic and Shawcross are disqualified via their high relative ownership numbers. Every other Stoke player is a viable candidate. Well, perhaps I'm letting my memories of the past get the better of me, but I can't scan the Stoke City lineup without immediately having flashbacks to perhaps the best goal I've ever witnessed on live television. Maybe you recall what I'm talking about. It was Stoke vs. Manchester City, March 24, 2012. Asmir Begovic launched a ball during open play from just inside his 18-yard box. Peter Crouch headed it wide to his right, where Jermaine Pennant headed it back to Crouch, who teed it up with the inside of his right foot before slamming a 25 yard volley across the penalty box to the top opposite corner, just beyond the fully outstretched arms of a completely surprised Joe Hart. I remember watching it live and shaking my head, thinking "Holy crap; did that go in?!?!". Well yes, it did; and the ball did not leave the ground from the time it left Begovic's foot to the time it folded the back of the Man City net. Incredible. And I'm taking a punt on Crouchy to put up some more magic at home against the Black Cats. It will be a tough match and one of those potential 6-pointers you love in a relegation battle (although yes, a little early to be talking in those terms). In the last 3 gameweeks Sunderland have won the Tyne-Wear derby and have beaten Manchester City on either side of a disappointing loss to Hull City, while Stoke have played Man United tough in a 3-2 loss before drawing to Southampton and Swansea. With the likes of Altidore, Fletcher, and Giaccherini applying pressure, going with a Stoke defender is way too risky. I do see Stoke getting a hard earned result here, and am hoping that Crouch, eager to impress the home crowd, could provide another moment of brilliance and be the difference in a tightly contested 1-0 victory. Or so I'm hoping. Welcome back FPL and welcome back the banter. It's been a nice little break, but we've also all missed it and are itching to get back into the swing of things. Have a great weekend everyone and make sure Fantasy Premier League Hints is in your favorites list if it isn't already. DON'T BENCH RAMSEY, DON'T BENCH RAVEL! I benched them when I shouldn't have! Let's hope for no more repeats! After GW11 I was looking to bolster my defence. Vidic and Kolo are on my exit list. But I have benched Kolo for this GW (he won't be starting as much for Liverpool). As for Vidic, I'm willing to give him one final chance v Cardiff to play 90 minutes AND to keep a clean sheet (something he has failed to do for me!). Barkley has been a disappointment for me in recent weeks too. Everton's upcoming fixtures won't be getting easier and that was a factor for me to get rid of him. The only viable replacements were Sessegnon and Cabaye. The problem was that if I bought Sess I would have had to use my other free transfer, but didn't deem it viable. Sess's Monday night game against an injury hit Villa team makes him a differential captain too. For those that are familiarised with my team picks, I hardly ever pick players from the true team that I support. However, I decided to go for Cabaye as he has Norwich at home this week and WBA at home the week after. Debuchy was an option, but is unfortunately suspended. Cabaye is capable of taking decent free kicks, penalties and even corners. He isn't in theory an attack minded midfield player. But with no HBA, I would expect Cabaye to play a more advanced role and be first pick on set-pieces. His scoring ratio isn't too bad either - 16% in Ligue 1 and 17% in the PL for a box-to-box/technical player. My plan is to keep Cabaye until GW 14 and then switch him with Sessegnon when WBA's fixtures improve. I decided to opt for Ozil as my captain as he hasn't been fatigued by mid-week international football and is due a good innings at the Emirates. Southampton won't be pushovers but they are due to concede a few goals on their travels. Arsenal have a good home scoring rate. Ozil is one of the best assisters the world. He is very consistent & reliable as a team player. 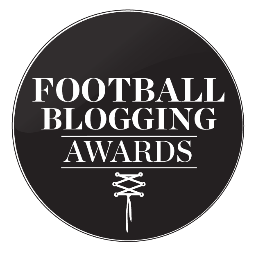 Football Blogging Awards: Please Vote For Us! With voting coming to a close this Sunday, I thought it best to lobby on this matter for one last time. I posted a quasi-manifesto in September prior to our blog being shortlisted. I would like to elaborate on the previous post and give you more insight about our blog. But before I do so, I must say that it is an honour to be shortlisted, especially against some of the respected heavyweights of the FPL community. We are truly humbled and appreciate the recognition wholeheartedly. This blog is run by volunteers and has gradually expanded over the past two years. Our increasing output hasn't been at the behest of quality. I could have instigated quicker expansion from the onset, such as adopting a dot com URL, stuffing the blog with tons of adverts and so forth. On a side note, I could have ditched it all together as I have had plenty of offers to write for other outlets too. But sometimes it's good to say no and take things one step at a time. I like the fact that I still use the "blogspot" suffix for my blog as it emphasises our rawness and authenticity. We don't offer a bog standard service or force you to pay fees to read our content. We are ordinary folks who are passionate about FPL. It's as simple as that! Thousands follow us on Twitter and more so read our posts on a weekly basis. Such interest continues to increase and as a consequence gives us impetus to carry on. Heck, we even sell shirts now! Our FPL Blog Team is a litmus test of our success. If we gave poor advice no one would read our blog. Yet the truth of the matter is that we generally talk sense! It is such a mindset that allowed me to be World No. 73 in 2012 or for Matej to finish World No. 15 in 2013. In relation to this season, our 82% success rate of weekly Hot Picks/captains (thus far) shows that we have been able to get it right in the past as well as the present. Even Walt's new feature (limited by strict parameters), #JackInTheBox, shows our depth in thinking - as was the case with his excellent pick in GW10. We aren't experts by any stretch of the imagination. But without our free insight would you be better off or worse off? Who else has shown you their team for every GW since the 2011/2012 season? 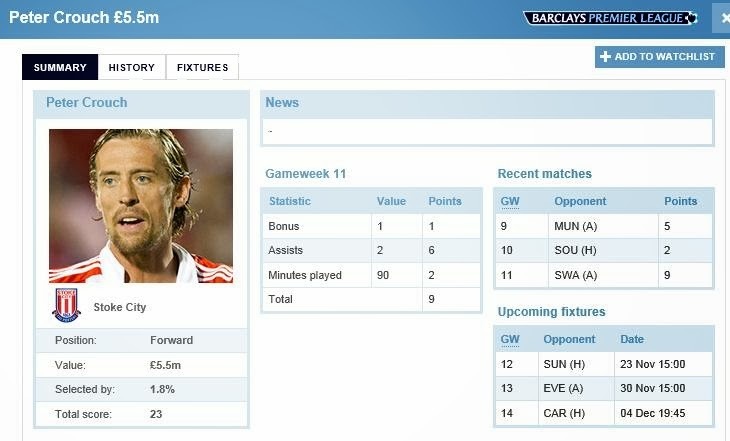 Who else shows you their captain and transfers or provides you with potential differentials on a weekly basis? If you don't wish to vote for us that's completely fine too. If that is the case I would personally recommend that you vote for Fantasy Yirma or Fantasy Football Pundits. In relation to the other categories, I have only voted for FutbolPulse as Best New Blog. Having said that I may vote for others in the remaining categories but that remains to be seen. You can vote for us through Twitter, Facebook or SportsLobster. Your vote is greatly appreciated by Walt, Matej and I. If you have ever benefited from this blog in any way and haven't voted for anyone else (post-nominations), PLEASE VOTE FOR US. Being a sentimentalist, GW11, at its very core, should be remembered for the tradition it honors so proudly and touchingly. 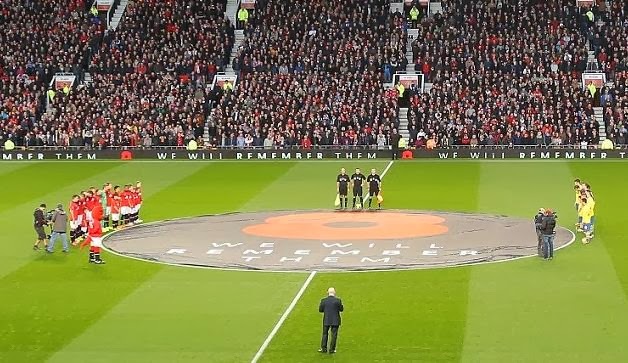 Sporting pursuits have long mirrored and reinforced cultural traditions of the society within which they operate, and the communal, national identity that is so strongly expressed through English football holds nothing back in the annual tradition of Remembrance Day. The spine-tingling roar of the crowd is eclipsed only by the minute of remembrance and deafening silence of respect and honor that precedes it. Pure class. Amidst the tradition of honor and respect on display in such a touching way, there were 10 EPL fixtures to be played as well and I am happy to summarize them for you in today's article. In all honesty, weekly reviews are my favorite. I have found that describing what's happened during a specific gameweek is infinitely easier (and recently much more fun) than attempting to predict what will happen before it starts. In a format I hope you enjoy and have become comfortable with, I will give you 3 headlines for each fixture, as well as dish out some important FPL related updates. Guzan and Co. notch another cleanie! Dikgacoi amazingly turns impressive Thomas cross BACKWARDS - wtf! This Sunderland-City curse is for real! Ramsey doesn't score - WHAT!?! Well, there you have it; GW11 in a nutshell. All of us at Fantasy Premier League Hints wish you an enjoyable international break and thank you for taking the time to visit this blog. Please take note of the paragraph below and vote for Fantasy Premier League Hints in the FBAs if you have not yet voted in the final round. Please remember that Fantasy Premier League Hints is a finalist in this year's Football Blogging Awards in the Best FPL Blog category. The Chief has worked extremely hard over a number of years to build and offer a blog of high quality and consistency. 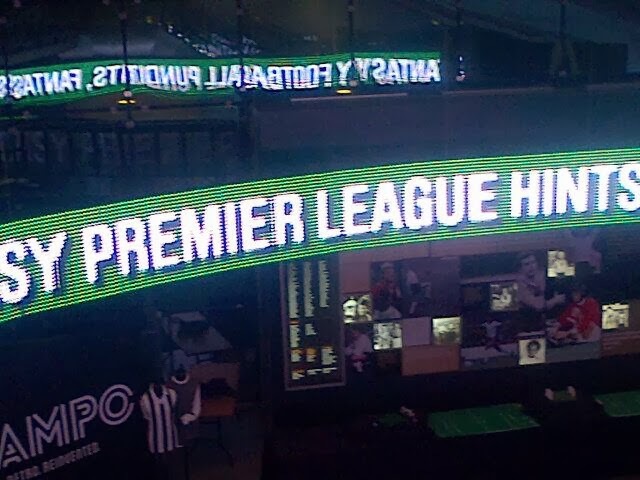 Fantasy Premier League Hints would be honored to receive your vote in the current round of final voting. If you haven't already voted in the final voting round, you may cast your vote between now and November 17. Note: Voting is allowed in both the preliminary round and the final round of voting, so even if you have already cast a vote during the preliminary round, you may also vote in the final round that ends November 17. "I am voting in @TheFBAs for @FPLHints as the Best #FPL Blog"
I know, where is the visual, right? My apologies, there will be none this week as I am away on a business trip and it completely slipped my mind that I don't have Adobe Illustrator installed on my company computer (DOH!). Don't worry, despite the lack of packaging, the goods are still coming. Last week Fernando did not deliver, but two of the mentions - Sagbo and Sessegnon did. Hope you had at least one. A popular pick this week seems to be Coutinho, who will do his best to play the inhospitable host role to the Fulham team, who have been on a receiving end of 10 goals in their last three matches (7 of those courtesy of Manchester City last week). While I do agree that he has the potential and he should start his first game in a while (after getting 45 minutes last GW) AND should take over the much coveted role of playing "in the hole" AND the fact that Liverpool will be hungry to bounce back after a disappointing defeat against Arsenal, I just believe that we can do better. Down to 8.5m (from 9.0m at the beginning of the season) and with an ownership of 4,7% he still deserves an honorable mention. Who knows, maybe by not selecting him for my #CalledIt, he will decide this is the time to shine and score a brace and add a trio of assists. Worth your consideration. Has the skill set, form is questionable. With having said that, form is key! Because of this, I select Samir Nasri as my #CalledIt for GW11. Sure, he might not play 90 minutes, but City is rolling right now and he has returned 3 assists and 1 goal in the last 6 matches. Especially with Silva sidelined (most likely), he should carry more offensive threat. As a risky differential, you can always turn to Mirallas. He is down to 7.2m and 3,3% ownership, but Crystal Palace should prove to be a resilient opponent this week. You can also consider Eto'o (with Torres out) and Negredo. Instead of posting a Jack In The Box article this week, I have decided to replace it with a week's worth of celebration and non-stop bragging over last week's successful pick on the maiden voyage of Walt's Jack In The Box ;) Nah, only kidding, but after the start to the season I've had, last week's selection has certainly been the highlight of my season to date. I will long remember sitting at lunch with my family, including my Mom, who was visiting from out of town, and feeling my phone start vibrating like crazy as my Twitter friends were spreading the happy news that Caulker scored. Along with my phone, I was literally buzzing. Thanks for the tweets! Ok, on to this week.... the bottom 5 have a pretty difficult run of fixtures this time around, with Palace at home to Everton (not going near it), Sunderland at home to City (hahaha, right! ), and Fulham away to Liverpool (no thanks). So it's gotta be between Stoke, who will be visiting the Liberty Stadium, and Norwich, who will be at home hosting West Ham. I feel as if I've picked on Swansea enough after last week and don't want to rub it in, so I'm gonna go with the Norwich-West Ham game. No easy task, given Norwich's shyness in front of goal this year and West Ham's solid away form. But I gotta go with one of the fixtures and I'm sticking with the home side again. Plus, I still believe Norwich are under-performing and could start to improve soon. So, Norwich at home, but who then? Well Snodgrass of course, but NO, he's owned by more than 3%! The other options among the squad are many, and I've had a good look around. Sporting Norwich's highest EA Sports PPI numbers for the season, along with being their top scorer this season, the nod goes to Jonathan Howson. Some of you may recall the stunner he put past Asmir Begovic during gw6 or the other goal he scored in gw8 vs league leaders Arsenal....if Norwich are going to get on the board and their forwards continue to struggle, it could very well be Howson to the rescue yet again. And with the next two upcoming fixtures being Newcastle away and Crystal Palace at home, he could provide returns for the short-term future as well. 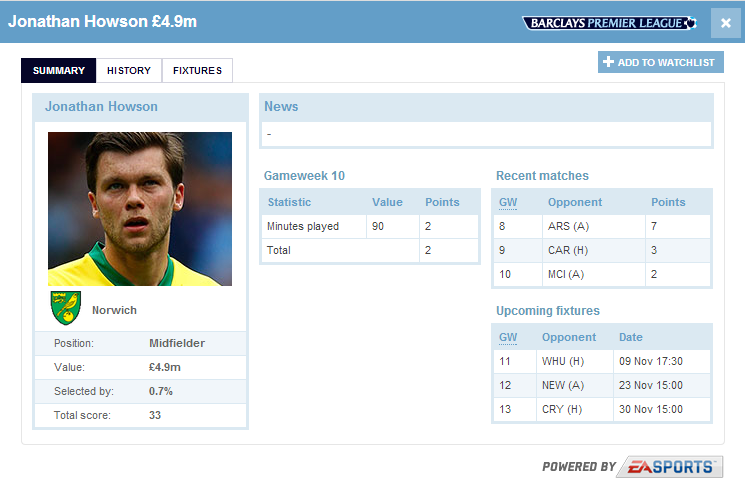 Good luck to you, Mr. Howson. May you sleep well tonight, maintain proper hydration, and make me look like a genius tomorrow (Matej too; as he thinks you're a good shout as well). Good luck in GW11 everyone.... I will see you shortly thereafter with this week's Wrap Up! Looking back at Gameweek 10 - Chief's "LESSLINES"